Maya Says You Can't Save Due to "Unknown Nodes" - What Should You Do? Autodesk Maya is a big and complex piece of software, full of traps and pitfalls for the unwary. The "Unknown Nodes" error sometimes occurs when you are trying to save your work, but Maya won’t let you save. This can be frustrating, and the solution is not obvious. What is an unknown node anyway? And what should you do when this happens? What is the Euler Filter in Maya? And When Should You Use It? Look under the Curves menu in the Graph Editor in Maya and you will see a button marked Euler Filter. Not knowing what it does (or even how to pronounce it), you have probably never used it - why would you? But don't be deceived by the odd name. The Euler Filter is a very useful tool in Maya, one which can solve - almost magically - some of the most common problems we get in the rotations of curves, problems which can seriously mess up your character animation. 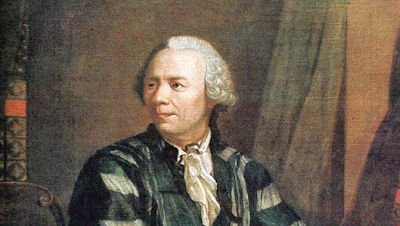 If the rotations on your character's arms are going wild, and no amount of keyframing seems to help - you probably need a little help from Dr Euler. Why Has Mental Ray Disappeared from Maya? Mental Ray is a renderer that comes free with Maya - but sometimes it goes missing. One of the most common questions new users have about Maya is this: "Where has Mental Ray gone?!" Every Maya user faces this problem at least once, and the solution is not always obvious. You look in the Render Settings menu and - Mental Ray is gone. So, what to do to bring it back? And why does Mental Ray disappear so often? John Cleese knows a thing or two about creativity, which is presumably why he was invited to give this talk in the video above. Trouble is, identifying where creativity comes from is like trying to analyse what makes a great poem. We all know it when we see it - but how to define it? And what does the great man conclude? I'll leave you to watch the (short) video to find out the answer. Where can student animators find free sets and props for animation? Where can student animators find free sets and props for animation? You don't always want to spend time modeling the things you need for your animation shot - sometimes you just need some free stuff in a hurry. The best places to begin are turbosquid.com and tf3dm.com. Both sites have plenty of free resources for animators to use; you can import sets, props, all sorts of useful items that will help bring your animation to life. Of course, you should always give credit to the creators - professional artists always give credit where it's due. Merry Christmas from the Float Folks! Merry Christmas from the Float Folks! And, of course, from all of us in the animation department at Bucks New University. To see more about the Float Folks, and their watery world of bobbers, dragon flies and dogfish, created by our students and recent graduates at Bucks, follow this link. Our new Animation and VFX course at Bucks is growing steadily, and our freshmen students are more dynamic and creative than ever, having made a stunning start on their first assessed animation exercise – an abstract animation piece set to music. We are proud to showcase here some of our students' best work. Part of the assessment involved collaborating with the sound design students at Bucks, helping our animators to take advantage of the stunning grange of facilities and talent available here at our High Wycombe campus. Film-making is rarely a solo venture, and working with other students who are specialists in their own field invariably helps our animators raise their game. How would a Jedi walk? Animating a person walking may seem like a simple exercise, but it's a tricky thing to get right. How people move has a lot to say about their character and personality, and it's no surprise that one of the first things an animator at a studio like Disney or DreamWorks will do with a new character rig - is to create a walk cycle. How someone walks is a window into who that character is, and how they might behave. Aspect ratios are one of the more technical aspects of our business - confusing when you don't understand it, and on the face of it a bunch of random numbers. It can all be pretty hard to fathom, with lots of geeky acronyms and odd terminology. 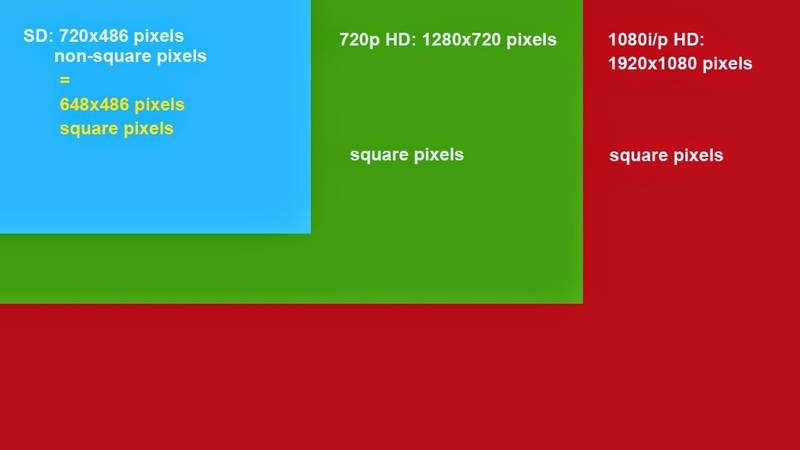 That said, a basic understanding of aspect ratios is necessary for all digital artists - it's how we configure our work for the screen. When you render your shot, and when you edit your work in Premiere or Final Cut, you will have to make choices as to what aspect ratio to select. So, to take the pain away, here's a link to an excellent blog post - aimed at digital editors - to explain all these confusing terms and what they mean. And below is a brief summary of how it all works. The secret of great animation is in the planning. Open up a copy of Maya, the leading 3D software, and you just get a blank screen. With CG animation (or indeed any animation) you get nothing for free. 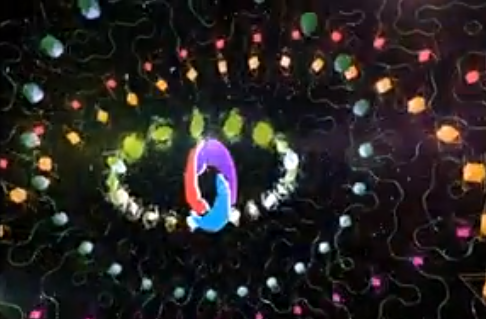 So how do you fill this blank space with creative, entertaining animation? The secret of good work is to thumbnail - that is to say, to plan out your work with sketches and scribbles which create a kind of road map of where you want to go. 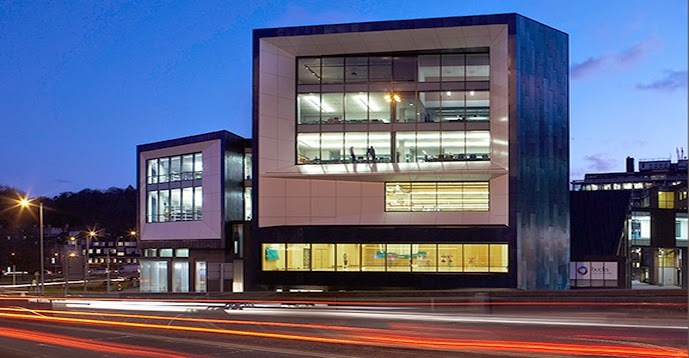 Animation & VFX at Bucks - Is It Too Late to Apply? 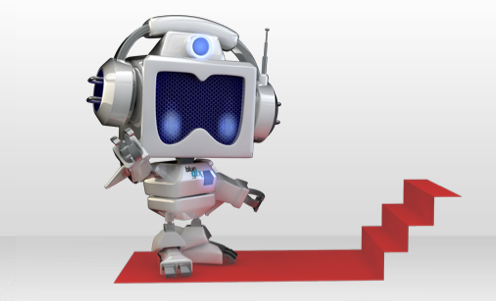 Thinking of applying to Bucks to study Animation & Visual Effects? It's not too late! The first UCAS deadline was 15 October, but we're still welcoming applications for our fast-growing new course, which is already producing excellent results. Below are some good reasons why we believe we are building one of the best courses in the country, plus some useful information on who we are, what we do, and how to apply. Calling all Bucks Animators! The Bucks Students’ Union is running a competition for university students and alumni to produce a short video about what it’s like to study here at Bucks. There is £750 up for grabs with a £500 prize for the most-viewed video at YouTube (ie a popularity contest) and a second prize of £250 for the best video as judged by a university panel. How do quadrupeds walk? On four legs? Or on two? 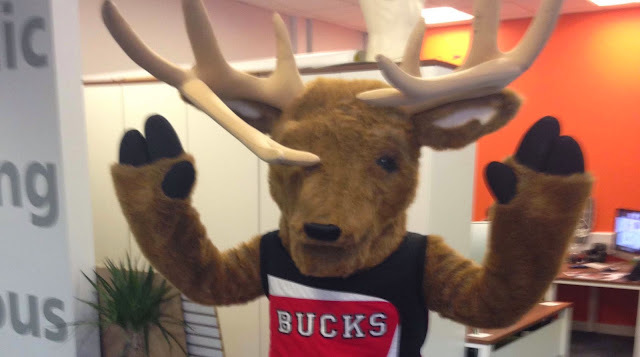 We decided to seek a little assistance from Rusty, the official mascot of Bucks New University, to help us figure it all out. Animation course leader Alex Williams got Rusty to demonstrate how real deer walk, trot and run. Sort of. Calling all Bucks Animation Graduates - Blue Zoo are Hiring Junior Animators! 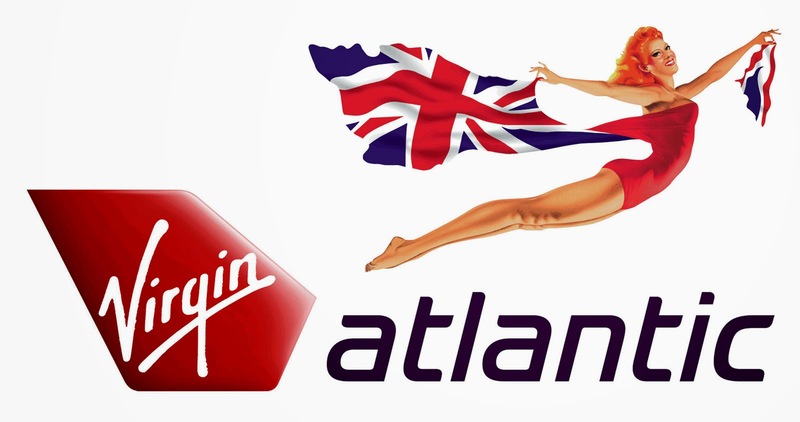 Calling all Animation Apprentice Graduates! London's leading TV animation house Blue Zoo are hiring fresh talent. Getting that first job is always tough, and it's relatively unusual for studios to be looking actively for juniors. So, time to polish that demo reel, make sure your best work is online and free of mistakes, update your CV, and send it all in with a nice covering letter. Free laptops have arrived at last for our first year Animation & VFX students. Everyone gets a brand new Lenovo ThinkPad T540P, with a 2.5Ghz i7 processor, 4Gb of Memory, and a 500Gb hard drive. It also has a full HD screen and a dedicated games card - very useful for high poly applications like Mudbox and ZBrush. These laptops should be well able to cope with pretty much anything our students throw at them for the next three years. It means our animators will be able to work from home, on the train, in the library - anywhere they find themselves wanting to get on with their studies. 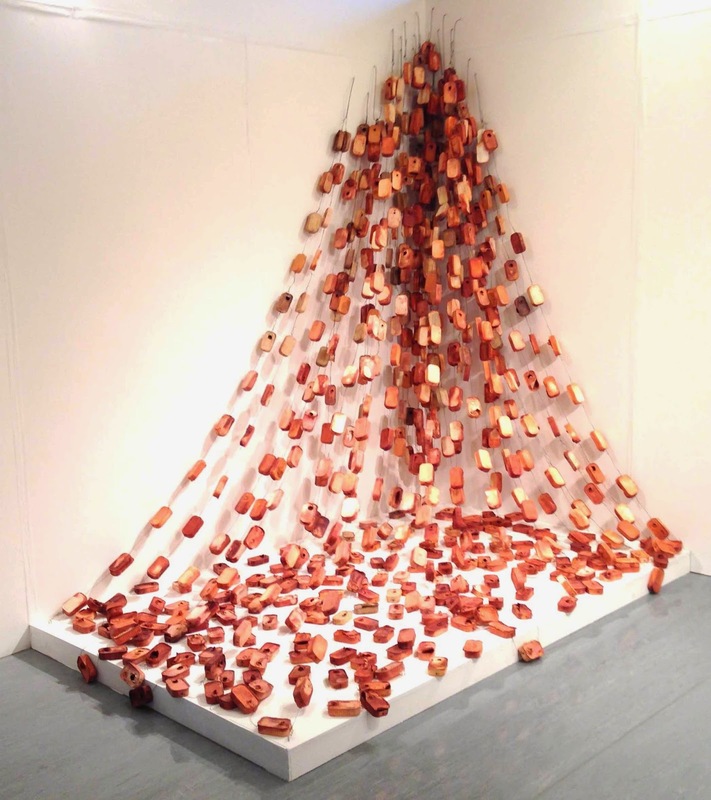 MA Art and Design Exhibition at Bucks - Now Showing! The free MA Art and Design Show is currently showing in the halls at Bucks, a reminder that animation is very far from being the only creative art form going on at our university. This year’s MA Art and Design Show began with a private view last week and is open to the public until Thursday 11 December. Take a walk around the Gateway Building and admire the excellent work that goes on here at Bucks, and celebrate the creativity of our designers and artists. Calling Bucks Animation Graduates - Brown Bag Films in Dublin are Hiring Animators! Fancy moving for Dublin for a spell? It's not a silly question. Dublin is one of Europe's most vibrant capital cities, and regularly appears high on the list of places you might actually want to live in. Brown Bag Films are looking for a broad range of animation talent to join their thriving studio in Dublin's Fair City. If you would like to join the team behind shows like DocMcStuffins, Octonauts, Henry Hugglemonster and Peter Rabbit, then send an email jobs@brownbagfilms.com attaching your CV, a well-drafted covering letter - and (of course) a link to your demo reel. A new student loan system for postgraduate master's degrees starting in 2016 has been announced in the Chancellor's Autumn Statement. George Osborne said the new loans would "revolutionise" access to postgraduate university courses - this is very good news indeed for any of our students who would like to go on to do an MA in animation or related fields in digital media. Our Latest Commercial Project - Meet The Float Folks! The Float Folks - Coming Soon! 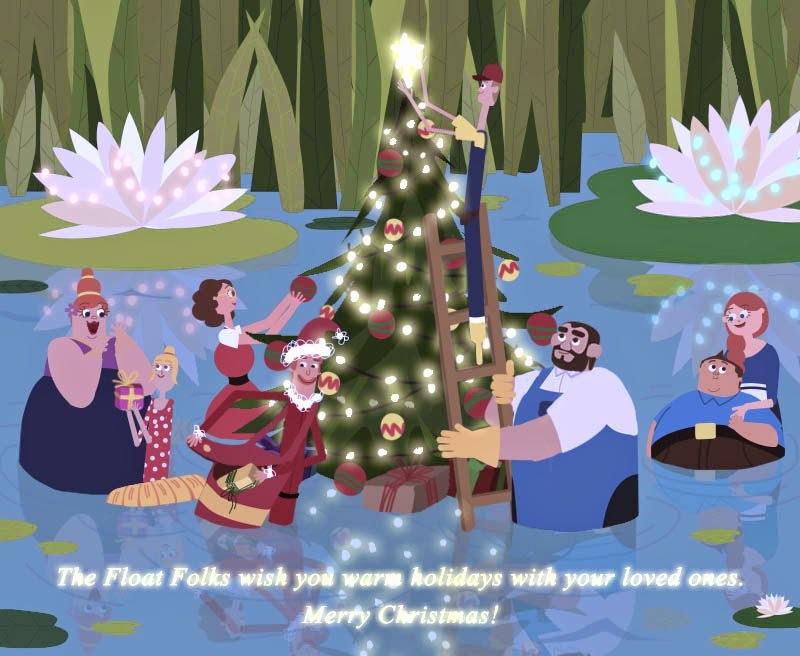 Bucks animators have recently finished work on our newest commercial project - The Float Folks - a teaser for a new TV Series which is the brainchild of creator Ian Foyle. The Float Folks invites the viewer into a world of fishing floats; a small town by the reed beds where everyone gets along (mostly) and the only way to travel is by dragonfly or dogfish. The project was designed by Bucks Animation graduate Monika Dzikowicz, and animated by a number of our recent graduates and current animation students. We're excited to see this project come to life, and thrilled to have been a part of making it happen. Mathilda - a new Free Rig for Maya Animators! Mathilda is coming! This new free rig, now available for use by Maya animators, has just been released by SCAD - The Savannah College of Art and Design. We haven't road-tested it yet, but it looks cool - with a really nice range of facial expressions. 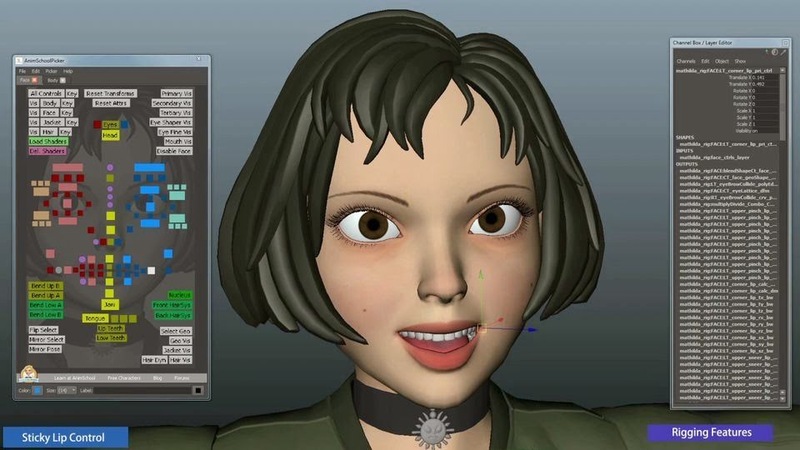 Mathilda looks very attractive, well designed, and we're excited to see what our students can do with this latest addition to the now very wide range of freeware available to those learning to animate in Maya. Lyuboslav Angelov is one of our first year animation students, having made his way to High Wycombe from Bulgaria to start with us on the second year of the new Animation and Visual Effects course this past September. We asked him to talk about what it was like coming to study in the UK, how he is finding the course so far, and what some of the challenges have been. Bucks animation lecturer Alex Williams contributed some early design work for Paddington, the new feature film about the much-loved bear created over 50 years ago by author Michael Bond. We asked Alex to talk about what he did on the film, which is released in theatres in the UK today, and how he managed to work on a major motion picture while lecturing on animation at Bucks. Today - Jobs Fair at Bucks! Today is the annual Bucks Jobs, Careers & Volunteers Fair at Bucks! Over 80 employers, charities and other organisations looking to recruit are coming to our High Wycombe Campus. The event takes place in the Gateway Events Hall between 11am-3pm today. Free laptops are coming at last to our first year students; slightly delayed due to some procedural glitches in the procurement process - but now fortunately on their way. 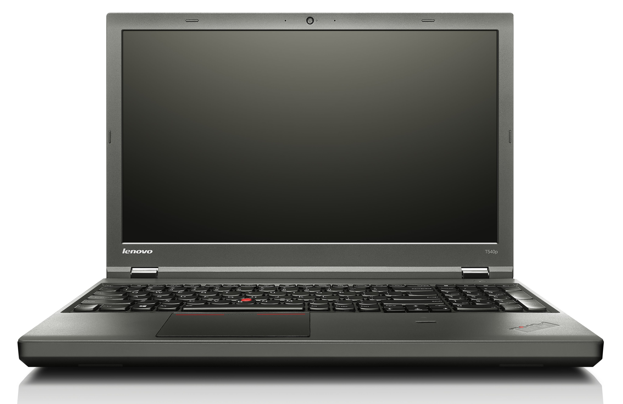 Our students will be getting a Lenovo ThinkPad T540P, with a 2.5Ghz i7 processor, 4Gb of Memory, and a 500Gb hard drive. It also has a full HD screen and a dedicated games card. These laptops should be well able to cope with pretty much anything our students throw at them for the next three years. It means our animators will be able to work from home, on the train, in the library - anywhere they find themselves wanting to get on with their studies. The BBC is coming to Bucks, introducing an industry panel on Wednesday December 3rd from 12.30pm in Gateway Lecture Theatre, and launching a new partnership between Bucks and BBC Introducing, the part of the BBC that encourages new musical talent. Bucks students have been filming live music performances for some years now and have gained a bit of a reputation for doing this to a high level of professional skill. Hence the new partnership, supporting the BBC's remit from government to promote new music and find new, yet undiscovered bands. Bucks Animation and VFX students are in the process of designing a new virtual set for the Watford Hornets. Watford FC's involvement at Bucks New University includes working on the Club's online magazine programme, The HornetShow, with students studying BA (Hons) Film & Television Production; Audio & Music Production; and Animation & Visual Effects. Last Chance to Register for Cartoon Business! Cartoon Business is the finance and business counterpart to Cartoon Movie and Cartoon Forum. If you are interested in the business side of producing animation, but don't know how to assemble, package and sell an animated TV series or feature film, then Cartoon Business is the place to learn. Supported by MEDIA, the EU fund for the creative industries, and backed by the French Government, Cartoon Business will walk you through all the steps needed to bring your ideas to the market. And you don't even need to speak French - the event is conducted in English, the international language of media and animation. Learning to pitch is an important skill for any artist. Sooner or later you will be called on to persuade a client that you have a great idea to sell their product, or perhaps try to sell your own idea for a TV series or feature film to a network or production company. Either way, you're going to need to learn how to pitch your ideas. Pitching is not just about standing up and delivering a persuasive summary of your awesome idea, it's also about what should go into it in the first place. How much character work and design do you need to do? How well thought out does your story need to be? In this excellent blog post, Disney designer Chris Oatley explains what goes into a great animation pitch and bible. 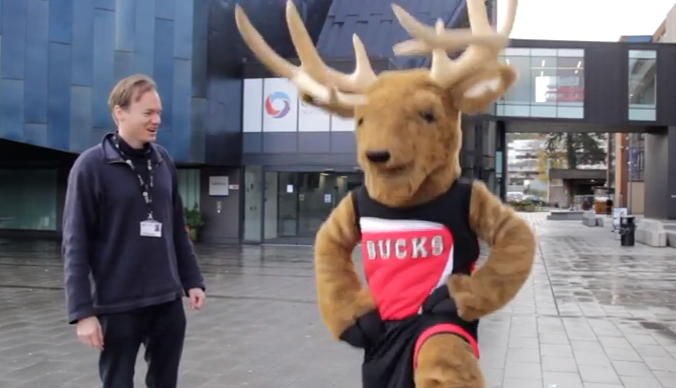 As everyone at Bucks knows, Rusty is our official university mascot, the big furry character with antlers who welcomes you to our University Open Days and to Freshers’ Week. This week we did some filming for a short video about life at the university, and we needed someone to play Rusty. Fortunately, Kalim Momen, one of our 2nd year animation students, was game to try out the Rusty suit, and see what life is like as a loveable cartoon deer. Last week Bucks New University students went to the Blue GFX Expo in London – a massive annual visual effects event sponsored by Autodesk, and a great opportunity to find out about the latest developments in our industry. There were presentations about Autodesk Maya, 3D Studio Max, a chance to try out the latest Cintique tablets, and best of all a talk by Framestore about the work they did on Gravity, a film that looks and feels like a live action movie, but is entirely animated. OK, George Clooney and Sandra Bullock were real – but the rest is CG magic. 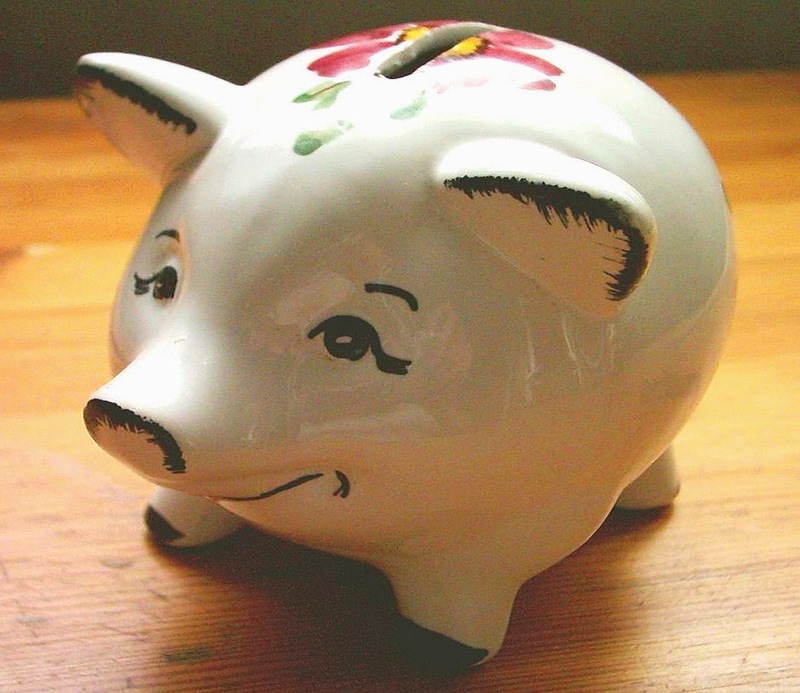 Should Freelance Animators Set Up a Limited Company? Part of our job at Bucks is to teach our students to be working professionals, which includes not only the ability to do excellent work at a high level of professional skill, but also the ability to run a small business and tackle freelance work. 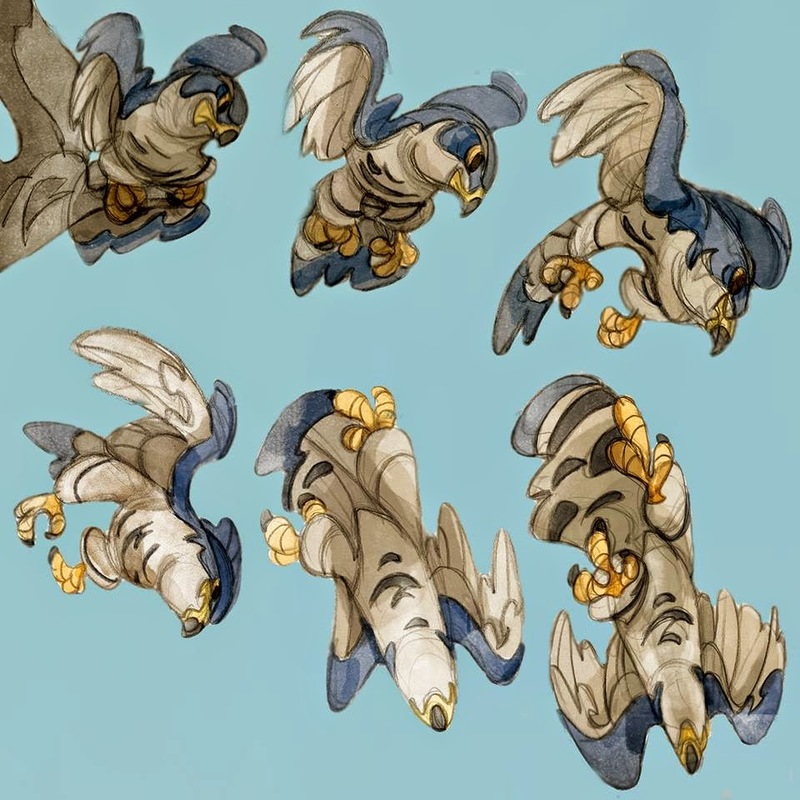 Almost all digital artists take on freelance work of one kind or another, and we help our students out by bringing in small commercial projects at our virtual online studio at nano-films.com, giving our students paid experience on live briefs. Being a freelancer involves learning a lot of new business skills, and one of the most common questions asked by students is: "Do I Need to Set Up a Company before I become a freelancer?" The short answer is "no", but it's not quite as simple as that - it all depends on your personal circumstances. Jobs, Careers & Volunteers Fair at Bucks on Thursday 27 November. Welcome to the 2014 annual Bucks Jobs, Careers & Volunteers Fair! We’re looking forward to welcoming over 80 employers, charities and other organisations to the High Wycombe Campus to attend this year’s Jobs, Careers & Volunteers Fair in the Gateway Events Hall between 11am-3pm on Thursday 27 November. We do not design and build our own rigs here at Bucks - there are just too many excellent free rigs and sets provided by Maya enthusiasts for student use. We point our students to the very best freeware rigs from the web and show you where to find them. In the end though, it is up to our students to find the rigs that they most enjoy animating with. There are so many; all have their strengths and weaknesses. Below is a list of some of the best, and where to find them. Wednesday 19th November - Come to Our Next Open Day at Bucks! Wednesday 19th November is our next Open Day at Bucks. Open Days are a great way to meet the Course Leaders (for Animation & VFX - that's me and Dave Creighton) here at Bucks, find out about our courses, and also explore our campus. We're sure you'll be impressed by the state-of-the-art technical equipment we have in the brand new Gateway Building; the result of a £40m investment program completed just a couple of years ago, aimed at turning Bucks into a creative hub for media production of all kinds. How do animators break into character design? Character design is one of the most fun and the most desirable jobs on an animated film, entitling the artist to give free rein to their imagination, come up with great ideas - and even get paid to do it. We asked Luis Grane, an animator and character designer whose work can be seen on dozens of animated films including Prince of Eqypt, Hotel Transylvania, Ratatouille, and Open Season, to talk about this work and how he broke into the industry. Most recently Luis did character design work for The Box Trolls, recently released worldwide in theatres. So what is involved in working as a character designer at a big studio - and how do you get there in the first place? Free External Hard Drives For Our First Year Students! Many of our new freshmen students don't know that, as part of the Bucks Big Deal, they are entitled to a free 1TB USB 3.0 external hard drive. All our animation & VFX students get an automatic 5GB of storage on their local network here at the Uni, but this space tends to fill up fast, especially once you start rendering high resolution images and large movie files. With that in mind, a free external hard drive is a great way store everything you need for your three year journey at Bucks. And, with a whole terrabyte of storage, the chances are you will never run out. Maya is a wonderful piece of software but its audio tools are not especially sophisticated. You only get one audio track, and it will only accept certain kinds of audio files (wavs and iffs). So, how exactly should an animator approach the use of audio files in Maya? Below is our handy guide which should answer most of the vital questions. Monday November 17th is the start of Activities Week at Bucks - a chance to explore the many and diverse aspects of life at the university, and tackle something new, exciting and different. It's all organised through the Bucks Student Union and forms part of the Bucks Big Deal - which aims to offer our students great value for money, making sure you're not confronted with unexpected costs or extra expenses. Best of all Activities Week is a chance to try your hand at stuff you've never done before. There are plenty of free rigs available these days for the use of students. One of the best is Morpheus, created by the prodigiously talented Josh Burton. 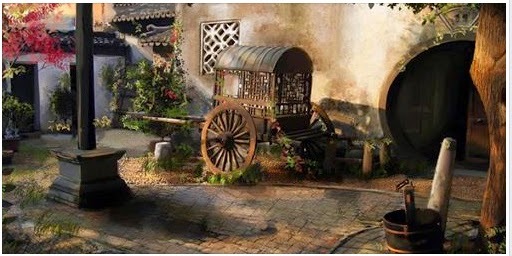 It is used extensively by trainee character animators hoping to polish their skills and get better at their craft. Morpheus is an excellent rig but, like all free rigs (and, frankly, like all rigs), it does have a few quirks. Below is a guide for animators to some of the main problems that we have come across, and how to fix them. Animation at BFI in London - Raw Shorts on Saturday November 22 - Just £6! The British Film Institute (BFI) is running a session on animation titled "Raw Shorts" for aspiring animators and film-makers, on Saturday November 22nd in London, at 12.30pm. There will be lectures, workshops and Q&A panels on all aspects of animation production. We highly recommend that our students attend - at just £6 per head this is the perfect way to learn about the industry and maybe even meet some movers and shakers in the business. Mike Nguyen is a veteran animator who has worked on many classic Hollywood feature films such as "Beauty and The Beast" and "Space Jam". 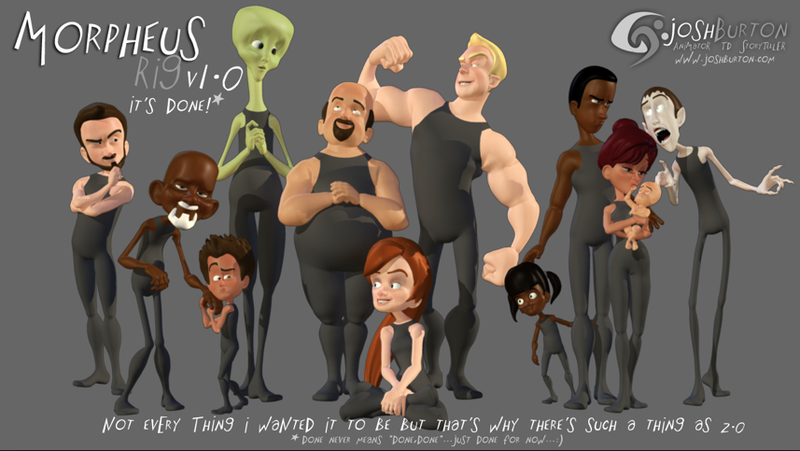 He was a lead animator on Brad Bird's classic "The Iron Giant" and also on "Osmosis Jones", and has been working for a number of years on his own independent animated feature film "My Little World". Here he talks to Bucks about what makes a great animator. Escape Studios are running their latest VFX Festival on January 28th at the VUE Cinema in London's Shepherd's Bush. To find out more, and sign up, follow this link. The event is an excellent way to find out about careers in animation and visual effects, what jobs are out here and how to break in to the industry. Every November we stop lectures for a week and run a series of activities and industry-related events. This year the Department of Media Production is joining up with the business school and computing and technology courses to run ‘The Future of Media’ Day on Monday November 17th. Part of this will be a speakers’ panel Run like The BBC Question Time programme. Previous speakers at other events have come from companies such as Mediacom, Burson Marsteller, Millward Brown, Dare, Rapp, BBH, Dun Humby, ITV, Shell and Ford. The audience will be students, alumni and clients. The panel session would be in the afternoon, runs for about an hour, from 14.00 until 15.00. Radoslav Hristov is one of our newest students at Bucks, having come to High Wycombe from Bulgaria to study Animation and Visual Effects. We asked him to talk about what brought him to the UK, and what life is like at Bucks for students from overseas. It's amazing how much free material there is on the web nowadays for learning animation. Studying at University gives you a formal curriculum, a (hopefully) properly thought out program for your studies and your eventual maturity as a well-rounded digital artist. But your tutors at university won't teach you everything. Along the way, doing tutorials online is a great way to learn and improve your work. Sabah Masood is one of our newest tutors at Bucks, having just started teaching our students pre-production concept art and development. Sabah has a wealth of freelance experience designing, building and lighting 3D interiors and sets for clients such as Pinewood Studios. Her expertise helps to fill out some gaps in our existing curriculum, making sure that our students are fully prepared for a long and successful career in the digital arts. We asked her to talk about what she is teaching at Bucks, and how the experience has been so far. 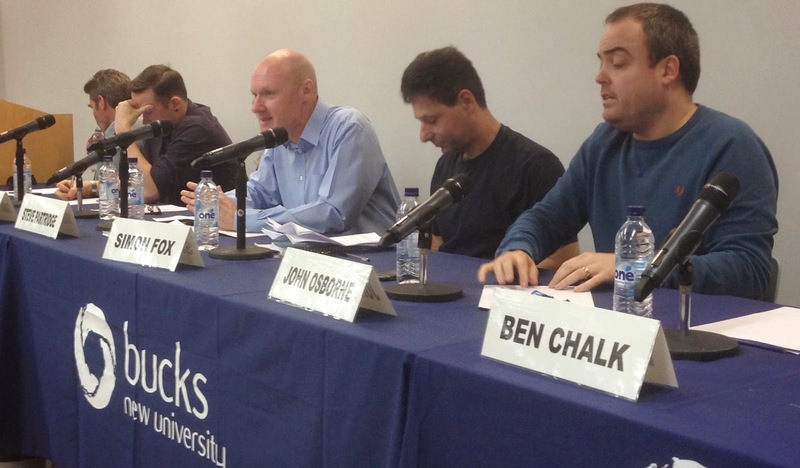 Film & TV at Bucks Wins Creative Skillset Accreditation. Yay! The Film & TV course at Bucks has just has just received conditional accreditation from Creative Skillset - the UK Government body which oversees university courses in the creative industries. More specifically, Creative Skillset have given Bucks "a conditional pass and recommendation to accredit", which means we're not quite there yet; some work still needs to be done, but now there is little other than time and diligence standing in the way of full accreditation. 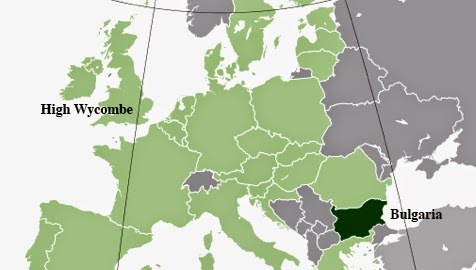 So, what does this mean for Bucks, and why is Creative Skillset Accreditation important? Paul Franklin gave a free lecture at Escape Studios in London on 15th October about the work of a visual effects supervisor. 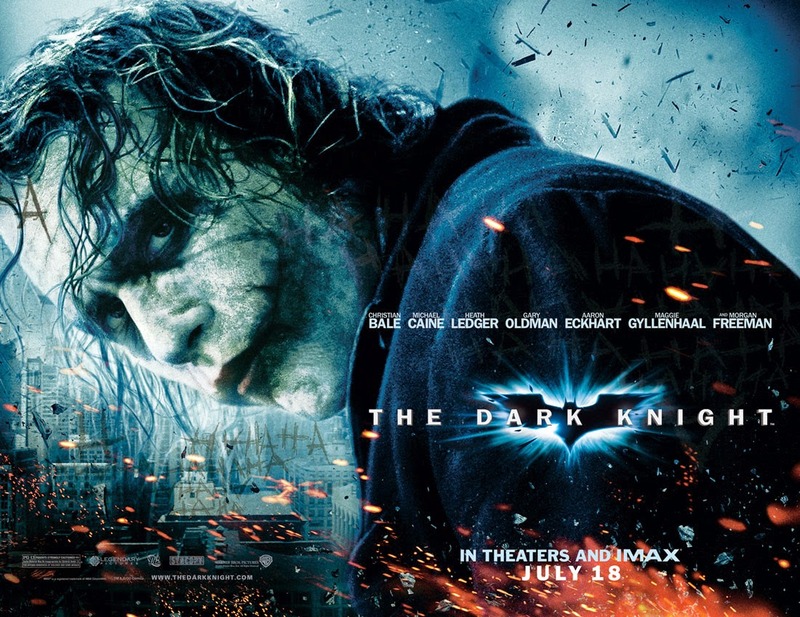 He talked about what goes into the making of the sophisticated films he has supervised, such as Dark Knight, Inception, and Interstellar - coming out this November. Franklin is an Oscar nominated VFX supervisor with two BAFTAs on his shelf. Clearly, he is a man who knows VFX inside out, offering a unique insight into how big budget visual effects blockbusters get made. 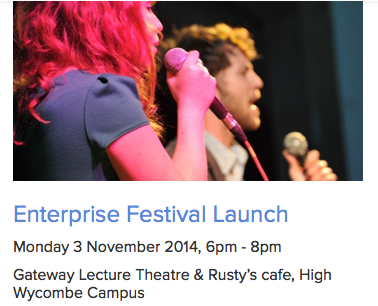 Enterprise Festival at 6pm on Monday 3 November at Bucks - Free Drinks & Nibbles! Calling all animators at Bucks - mark your diaries for the Enterprise Festival Launch Event at Bucks on Monday 3 November, which runs from 6pm to 8pm. You can find out about how Enterprise at Bucks can help you start up your own business, and become a freelance digital artist. Best of all, Complimentary food and drink will be available, as well as the opportunity to find out more information about this year's festival. Rob Kelly is a director with a long track record in the TV industry, and of course he is one of the tutors on the Animation and Visual Effects course at Bucks. Rob lectures in motion graphics, primarily using AfterEffects to teach our animation students (amongst others) to create excellent motion graphics work. 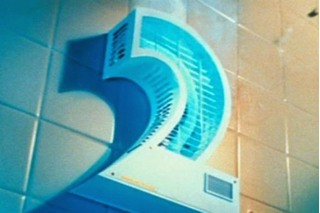 In this interview at the Film and TV blog at Bucks, Rob talks about his work directing some of the classic BBC 2 Idents, and how he created them. Calling all Bucks Animators - Social Media Job! 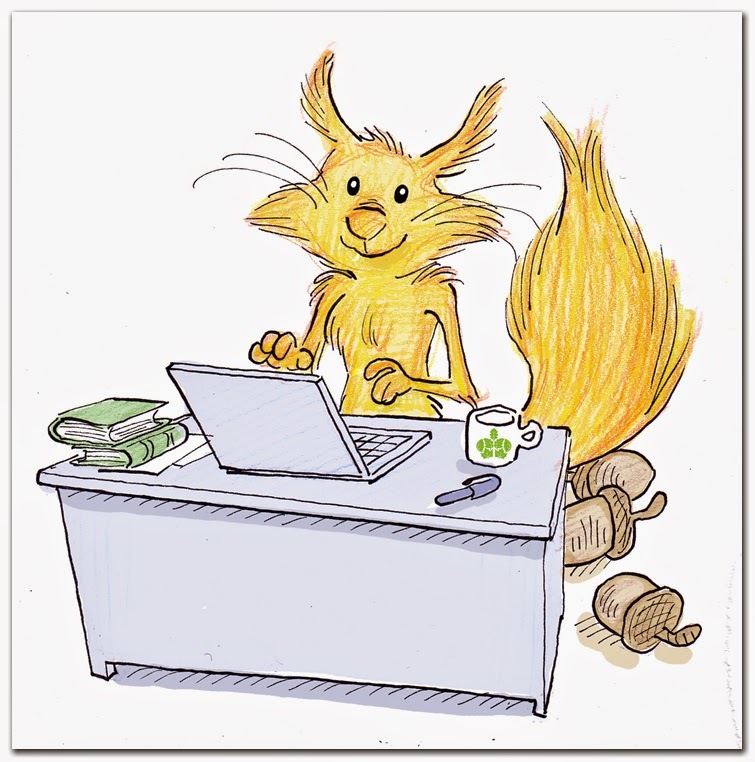 Calling all Bucks Animators - If you have a little knowledge of Social Media and would like to make some money and also add some job experience to your CV - Bucks New Uni is looking for a Social Media Ambassador - ideally a 2nd year Animation & Visual Effects student, who will work with the Department of Media Production to help get the word out about all the exciting work being done here at Bucks. In this short video Bucks tutor Dave Creighton explains how to import images into Adobe Premiere and then export a movie file. For anyone who has not used Premiere before, this simple video explains the basics in a very clear way, and show you how to export a movie file in simple steps. It is especially useful for animation students who have created a series of images in Maya, using the batch render procedure, and want to turn those images into a movie file that can be uploaded to YouTube. Thanks Dave! 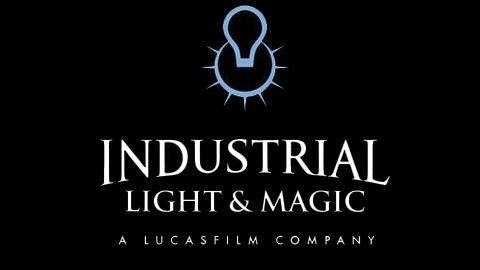 Industrial Light and Magic is opening a brand new UK studio to work on a new Star Wars trilogy. Disney’s special effects firm was founded by George Lucas back in the early days of VFX, and now ILM is coming to London even as Pinewood Studios' filming of Star Wars VII nears completion.